This past weekend I volunteered with Friends of Kahana at the Huilua Fishpond, one of my field sites. An interesting connection between my field sites, those with submarine groundwater discharge, and ancient Hawaiian fishpond sites. Many sites with submarine groundwater springs are also sites that were chosen by ancestral Hawaiians as sites for loko iʻa, or fishponds. This is in part because many fish species travel between these estuarine, where fresh water and salt water are mixing, during their lifespan. The estuary is a natural nursery for many reef fishes. The end of the semester is always a busy time with the culmination of classes and grading, so it was great to get out and do some physical work to give back to the community at one of my field sites. 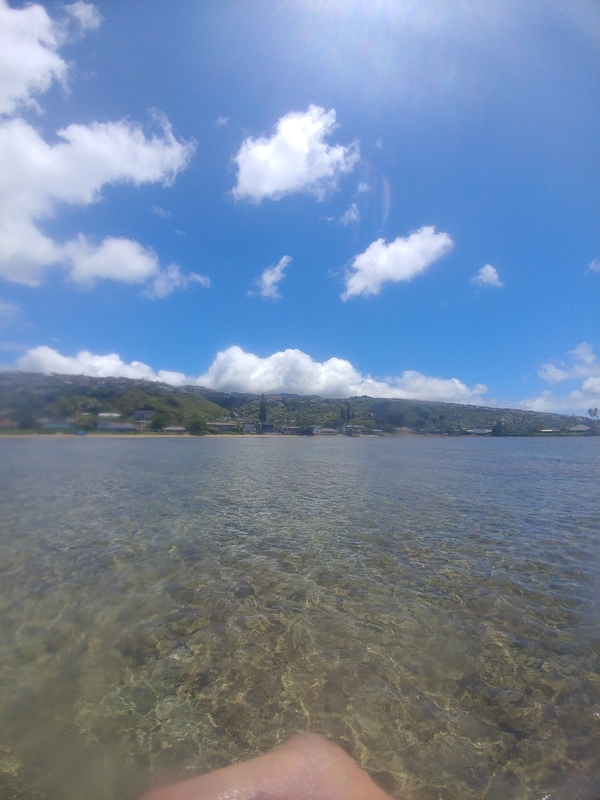 The caretakers of Huilua fishpond were wonderful people to meet who have a great knowledge of Kahana, having lived there their whole lives and their family for generations before them. 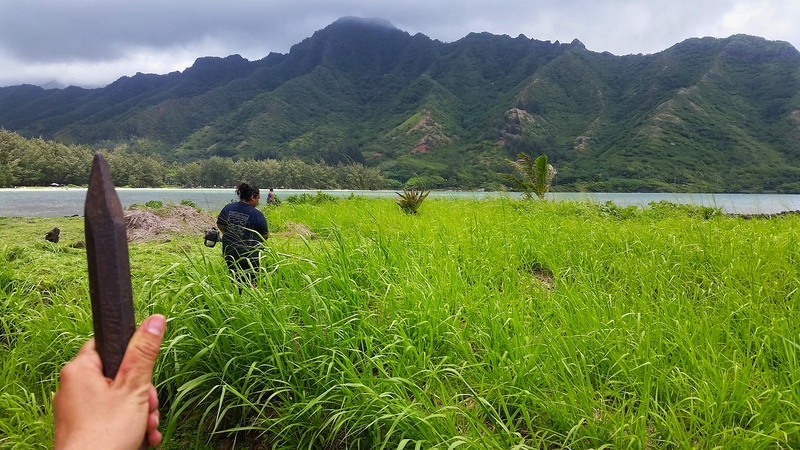 In their lifetime Huilua has become inundated with invasive mangroves (Rhizophora mangle is the most common mangrove species in Hawaiʻi, though several exist) and guinea grass (Panicum maximum). Guinea grass (Panicum maximum) fills the northern end of the fishpond. Here the lovely ladies of Kahana are clearing with weed whip while I dig out the roots with an o`o bar. Kahana bay and valley can be seen in the background. The mangroves have grown over and most likely altered the natural spring that feeds into the fishpond, while the cane grass has blocked one of the auwai, or gates that allow fish and salt water into the loko iʻa from the ocean. Kahiau, the caretaker of the site, explained to me that the plan is to remove the fountain grass and dredge the sediment that has accumulated inside the pond, and to remove the mangrove by chainsaw. I am certainly interested to get a baseline benthic analysis of the reef community outside the loko iʻa and to monitor for any changes with the restoration of the spring and the loko iʻa to their historical conditions. There are so many duties to stay on top of as a scientist, research, data processing, writing, publishing, presenting your research. However, connecting with the community is one of the most important and often forgotten responsibilities we have as scientists today. Without a connection to the community your research may never be enacted or understood by the people who are effected by it. What’s more is the people who live and work in these environments are the true experts of these ecosystems, and are often great resources to help your research become much more informed and useful than it would without their input. As someone who is trying to understand an ecosystem in the short timespan of a PhD thesis, in just 3 or 4 years, people who have spent their lifetimes and have knowledge that has been passed down through generations are an amazing resource when it comes to the cycles, changes, and natural phenomena of a place. Mangroves can be seen in the back corner of the loko iʻa, most likely covering the site of part of the submarine groundwater discharge spring.